Essential Living's planning application for the redevelopment of the site containing Morrisons and the associated car park was approved at Planning Committee yesterday. Four councillors voted against: Cllrs Mel Collins, Guy Lambert, Sheila O'Reilly and Tony Louki. Seven voted in favour with one abstention. The third Brentford ward councillor, Myra Savin was in the audience which was packed. The agenda and officer's report can be accessed here. The minutes will appear there once aprooved. Essential Living (EL) spoke first, briefly describing their rental model and the need to look at the long term future of Brentford rather than the short term. They announced that they have signed Heads of Terms with Lidl and Marks & Spencers to provide a joint offering, as they do elsewhere in the country [like Acton]. 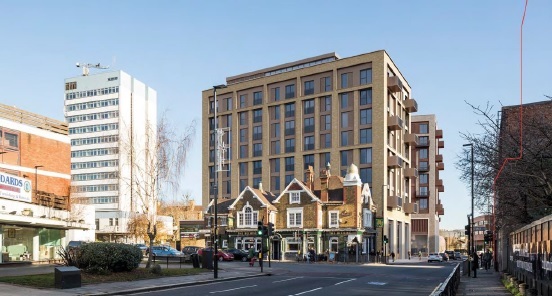 They acknowledged the reversal of the 75:25 commercial to residential mix as specified in the Local Plan and confirmed that the sunlight/daylight study showed there wasn't a problem, even with St Paul's School. They will talk to Lidl about a temporary store; they will provide a shuttle and will look at help with home delivery. Cllr Mel Collins asked about wind impact, which was stated to be negligible. EL clarified that the sun/daylight study was done in accordance with guidelines which suggests analysing a day at the end of March which is what was done. There are no specific guidelines for schools but the impact was negligible. EL also added that the study done by the objectors was not according to guidelines and wouldn't count. The development has no impact on Lateward Road. EL added in response to further questions from Mel that although there have been some parking spaces lost the parking is consistent with the London Plan and the food space is now larger than Morrisons floorspace. EL clarified that the late revisions to the plan did lose 7 of the 3 bed flats which was a side effect of losing a floor in one building. EL added that the provision of a temporary store was not included in the viability study [the calculation that shows what profit will be made from the development] and confirmed to Cllr O'Reilly that the development would not be viable with fewer floors and flats and would have to be "one big slab" (Sheila's words) if the height was reduced. Cllr Lambert asked about the affordable provision. After 15 years if these flats revert to market rents then EL have to pay an agreed sum of £50,000 per flat towards affordable accommodation elsewhere. He also asked about provision of shuttle buses and EL confirmed they would be free and they would make them as accessible as possible as Guy asked whether users of disability scooters would be accommodated. EL said in response to Cllr Louki that the temporary loss of a supermarket is technically not a planning matter, but a consequence of redevelopment. The Local Plan states 75% residential and 25% retail and this development is the reverse (24:76). EL bought the site two days after this was published and he wondered what assurances may have been given about what would be deemed acceptable for the site. There are no valid reasons for this ratio reversal and the application should be rejected on this alone. The development is overbearing, too dense and will cause harm to St Paul's conservation area. It does not conserve and enhance the character of the rea as the Local Plan advises. The additional floor in block B exacerbates the negative impact on the locally listed Beehive public house. [As this is locally listed rather than nationally listed there is no statutory duty to take specific note of the impact of any development]. While the loss of sunlight is negligible in March, when EL's calculations are made the school will suffer a serious loss direct sunlight during some two thirds of the school year, notably the winter months. The overshadowing will have a considerable effect. Morrisons currently sees 23,000 visitors per week. There is no solution to the temporary loss of a supermarket during the construction period and a shuttle bus three times a day to the nearest Tesco is not going to solve this. A local supermarket is vital to those without cars and/or with mobility issues. A shuttle bus three times a day is not going to cover it. Temporary parking should be provided as well to stop the whole of the high street being threatened during construction. The public response to this application has been overwhelming with over 3000 signatures to the petitions. Brentford residents aren't against development and would welcome suitable applications. Mel asked for further clarifications about sunlight study. The rough estimate was that the playground would be out of direct sunlight for three quarters of the academic year. Nick added that if planning permission wasn't granted there was no reason why Morrisons couldn't renew their lease when it expires next June. The supermarket is currently viable. As The Beehive and St Paul's School are locally listed they do not get special consideration. Urban design will be much enhanced. Five retail units will be added rather than just the supermarket so there is an improvement in the public offer. Brentford will gain a small square you can walk through and the vista up to St Paul's church spire. There is no loss of a supermarket as it will be replaced. There are many small retailers such as the local Sainsburys suitable for top up shopping. The Local Plan is not inviolable. All the differing needs must be taken into consideration. Hounslow needs to find space for affordable housing across the borough. The site has a high PTAL of 4 [access to public transport] which makes it a good location for added amenities and less important for residents to have cars. Brentford needs regeneration desperately and this will contribute. Maximising development on a brownfield site is in accordance with the London Plan. PRS is new to Hounslow and is providing 55 affordable flats. The rest are not going to be sold to overseas developers and be left empty. The applicants have offered to work with Friends of St Paul's Rec to improve the park and replace the railings [cries of "that's new to us" from members of Friends in the audience]. There is sufficient daylight for the school children. Albany Parade has a car park as does the high street, along with on street car parking. Guy said the current playground could be three times the size in order to meet current numbers of children at some times of the day. He got confirmation that Lidl would be the predominant supermarket. Mel asked about 40% affordable which Marilyn said was not viable. Cllr Louki asked why are we considering anything over six storeys. Marilyn explained that Policy CC3 says a limited number of tall buildings (over 20m) are allowed in town centres. Ballymore have two of them within its development. The two blocks south of Morrisons will be five and seven storeys right up to the high street. Cllr O'Reilly asked whether this is what the rest of Brentford will look like, referring to tall narrow alleys down to the waterway. Ballymore will look very similar. Cllr Rajawat moved for recommendation of the application. Cllr Louki said the site should be considered along with the adjacent police site and the Watermans site as a whole. He appreciates the view of the Beehive as he passes through. Six storeys is more than enough. He added that there was no absolute guarantee that we would get a supermarket at the end of this and will be voting against. Cllr Collins said that he couldn't support this. It's a gross violation of the local plan. The residential provision has changed for the worse and what was taken off one block has been added elsewhere. He added that we don't know what would happen to the supermarket lease if this application had not come in. Brentford councillors have been pushing for a temporary supermarket site right from the start. Cllr Lambert said that he had no problem with the PRS model, with the concept of Essential Living and that he welcomed their engagement with the community. But this is not in line with the local plan, there is not sufficient affordable housing and it is overbearing. He would vote against. At which point the application was voted through with Cllr Khulique Malik abstaining. Cllrs Anderson, Hughes and Lee had given apologies. During the discussion there were approximately four questions raised by councillors other than Mel, Guy, Sheila and Tony. The late addendum to the meeting added the point that "The applicant has also indicated a willingness to provide a contribution in-kind towards upgrading St Paul’s Recreation Ground, to include assisting with the restoration of the water fountain, supplying and planting trees to assist with the planting initiative and assisting with the refurbishment of the railings" which would be secured in S106. Visit http://planning.hounslow.gov.uk and enter P/2016/5573 in System Reference.